Hoffman Estates resident Kenneth White, 34, of the 700 block of West Bode Circle, was arrested Thursday about 12:30 p.m. at a traffic stop on Plum Grove near the McDonald’s restaurant at Higgins Road and Plum Grove Road. Schaumburg police and FBI agents were present at the traffic stop. White was in custody within seconds and without any unusual incidents after he pulled over when police activated their emergency lights. Police converged on his vehicle after spotting him and following him southbound on Plum Grove Road. Only days earlier, police had announced the identity of the bank robbery suspect. He fled the bank with $3,816 in cash. White was convicted of robbing the same bank in 2004. Additional charges for other bank robberies, including the Glenview State Bank in Arlington Heights on Black Friday, are expected. Kenneth White is the suspect in a Black Friday bank robbery at the Glenview State Bank (1808 South Arlington Heights Road) near Arlington Heights Road and Golf Road. Visual identity match connected him to five other bank robberies: MB Financial Bank at 2200 N. Waukegan Road, Glenview, IL on December 3, 2012; TCF Bank at 1415 Algonquin Road, Rolling Meadows on October 26, 2012; Popular Community Bank at 7181 West Irving Park Road, Chicago, IL on November 5, 2012; Harris Bank at 615 Busse Highway in Park Ridge on November 9, 2012; and TCF Bank, 2301 North Harlem Avenue, Chicago on November 15, 2012. 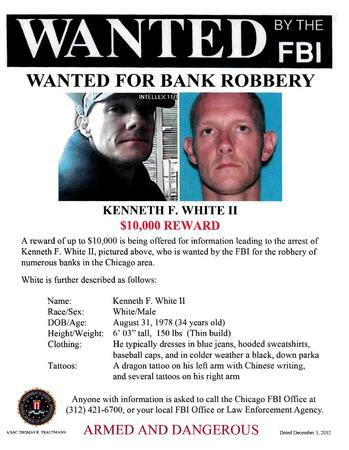 A reward of up to $10,000 was being offered for information leading to the arrest of Kenneth F. White II, as he was wanted by the FBI for the robbery of numerous banks in the Chicago area, according to an FBI Wanted notice. The offender was described as a male/white, 34-years-old (born August 31, 1978), 6’3″ 150 LBS (Thin Build). Kenneth White was described as typically wearing blue jeans, hooded sweatshirts, and various baseball caps (Cubs, Yankees and Notre Dame), and in colder weather a black, down parka. He has a dragon tattoo on his left arm with Chinese writing, and several tattoos on his right arm. The suspect was also labeled as armed and dangerous. 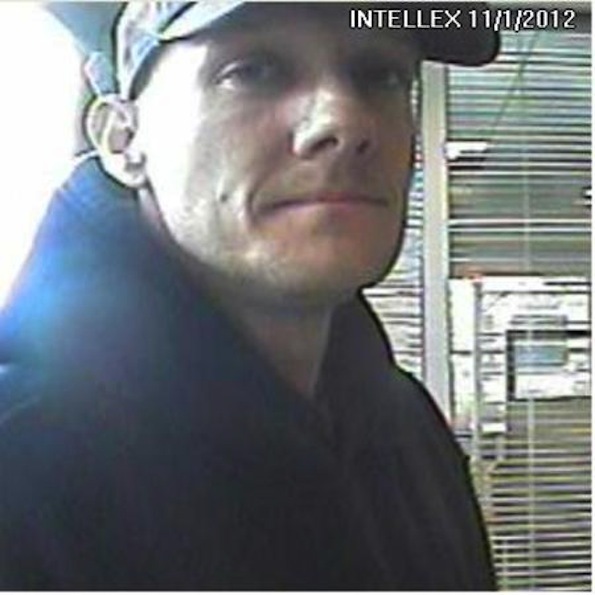 Bank robbery suspect most recently connected with the Glenview State Bank of Arlington Heights at 1808 South Arlington Heights Road on Friday, November 23, 2012 (Police released/bank surveillance images/More photos). 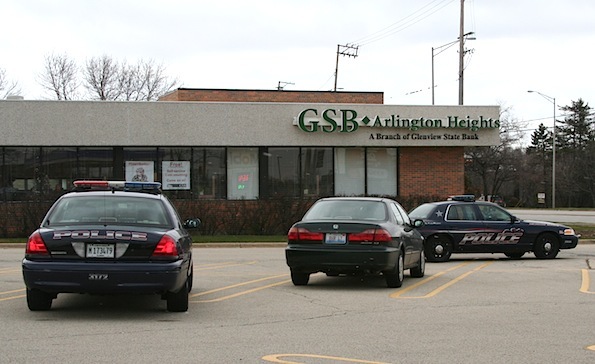 Police on scene of Glenview State Bank (GSB) on south Arlington Heights Road, just north of Golf Road. The offender put $600-$700 US cash in his jacket. On further investigation, the offender was reported to have fled from a vehicle parked in an apartment complex, just north of the shopping center where the GSB and Jewel-Osco are located. The vehicle was reported to be a van or taller vehicle, possibly blue or green or dark in color. The vehicle headed northbound on Arlington Heights Road.